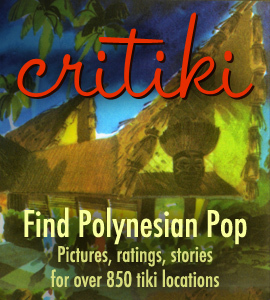 I’m very excited about my lastest website project — Mimi Payne hired me to create a website to showcase her extensive and beautiful collection of vintage ephemera and collectibles, mostly from Polynesian and other Exotic restaurants and hotels. The result launched today, and it is called Arkiva Tropika. Mimi’s collection is massive — not even she quite knows exactly what she has at this point, which was one reason she wanted it catalogued. Another is that it makes a great resource for her to sit and look through her collection, without having to take the sometimes-delicate items in and out of their proper storage. Paper ephemera is notoriously difficult to display; I think this is a great solution. Tags allow her to find all of her hotel postcards from California quickly, or even all of her hotel postcards except those that are from California. But the best part, I think, is that she’s also chosen to share her collection with the world, with relatively large, high-quality images. She has just a small bit of her collection in Arkiva Tropika right now (but there are already more than 175 images of nearly 100 items); she’ll continue to add items on a very regular basis. The phrase “eye candy” seems woefully insufficient — to me, looking through her collection is like stepping into Willy Wonka’s Chocolate Factory. I’m incredibly proud and honored that Mimi asked me to create Arkiva Tropika for her, and I look forward to much time spent in a dreamlike-state, looking over her collection. Wonderful stuff. I’m definitely putting this on my favorites. I will, Reever. Mimi has been adding new items seemingly non-stop since the launch; the site keeps sucking me in over and over again. On Tiki Central, makutiki said “It´s just like looking inside a whole new BOT [Book of Tiki]!” and I think that’s a great description of what it’s like, only we get new pages every day. It’s awesome to see niche ephemera in the spotlight. These are outstanding items that display well. It dovetails with what I’m trying to do with my site. The site you’ve created is really eye-popping and wonderful. Great job! Thanks for the kind words, I’m glad you’re digging the site!